For The Session: Beer Blogging Friday #114, Alistair Reece, aka Velky Ale — blogger at Fuggled— is the host. His theme is one word, with emphasis: "Pilsners!" What I want folks to do is put down their IPAs, their Belgians, their sours, their barrel aged stuff, and hunt out a few pilsners to compare and contrast, whether they be Czech, German, Belgian, American, etc, etc. Try to get examples of Czech and German in particular to see the differences. Most of all though I just want people to re-discover what I consider the pinnacle of the brewing craft, so off hunting you go! In retort, I wrote these two-hundred eleven righteous words. At best, the statement is dismissive praise, like saying that Mozart's String Quartet No. 19 —the Dissonance Quartet— is 'simple' music because the notes have been written down. At worst, his comment finds common cause with the major brewing companies in doing harm to their distant legacies of Czech and German lagers —and SAB/Miller Brewing, in particular, with its apostasy "true Pilsner" campaign: if we repeat something enough, it will be believed to be true. I'm going to avoid quoting formalistic delineations of OG/ABV/IBU and other alphabetic parameters. But I know a pilsner when I taste one: firm, slightly sweet, deep golden-hued malt; spicy, floral hops; crisp character, with a whiff of yeasty sulfur; gentle enough alcohol at about 5% to allow another sip, yet strong enough to make a statement; a long, dry, dare I say, bitter finish. And, above all, a clear, joyful declaration of the four ingredients of beer —malt, hops, yeast, and water— unencumbered by ale's zig-zag riot of dank hop, fruited yeast, and, nowadays, back-of-the-cupboard oddities. Bob Tupper —the past host of renowned beer tastings at Washington D.C.'s Brickskeller— is fond of a music analogy for beer. Ales are like jazz quartets. Each member goes his own way, but all finish together. Lagers are like string quartets. Hops, malt, water, and yeast play together in seamless performance. I would add to that: pilsners (lagers) are like Mozart string quartets. Jazz as an analogy predates Millenials, Gen X-ers, and even many baby boomers. If that's the rub, substitute your musical experience and you'll (hopefully) get to the nub. German-style pilsners are the original session beers. Nooner is our version of this classic style, loaded with floral and spicy whole-cone hop flavor and balanced by a crisp and dry finish. Finishing hops: Saphir, Tettnanger, Strisselspalt. Malts: Two-row Pale, Pilsner, Munich, Acidulated. International Bittering Units (IBUs): 32. It's a fascinating juxtaposition that today's The Session on pilsners follows on the heels of yesterday's #IPADay. Or maybe not. This month's host of The Session, Alistair Reece, is a beer polyglot: an advocate for Czech lagers, American mild ales, British/Scottish real ales, and an imbiber of American 'craft' ales. Maybe, more 'craft'-ers should be so. 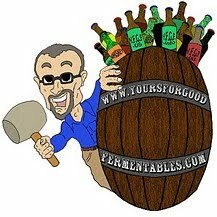 No disrespect is meant to the world of ales. But if one fancies her or himself a beer lover, and 'simply' dismisses lagers out-of-hand, she or he leaves undiscovered an entire hemisphere of delicious choices. * Miller Lite is not and has never been a pilsner, despite what the brewery may say. It is a N.A.I.L. : a North American Industrial Lager, and a watered down one at that. As are Budweiser and Coors, for that matter. They are, to borrow the writer's word, "simple." Read Mr. Reece's own contribution to The Session: at Fuggled. 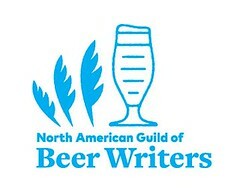 For more information on The Session: Beer Blogging Friday, or to ask to host a session, go to the home page. 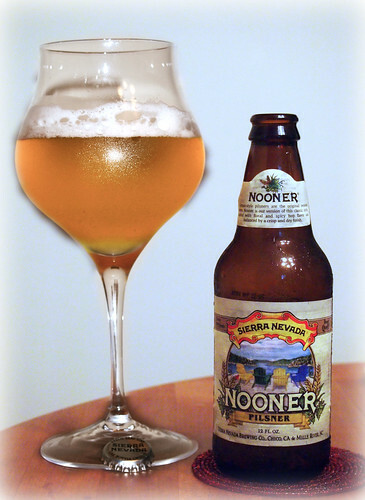 Funny you should mention 'Nooner' it was one of the American made options I drank before settling on Goose Island as my US representative - a fine beer indeed!